Martinrea CEO Pat D'Eramo says electric and autonomous vehicles are "great for us." VAUGHAN, ONT. — Martinrea International Inc.’s years-long acquisition spree has cooled. The supplier, which quickly grew to become Canada’s third-largest auto supplier by acquiring companies in aluminum, metallics and fluid-management systems, is content with what it has, Martinrea Chairman Rob Wildeboer told Automotive News Canada. Wildeboer and the company’s top executives said any deals would have to work in the context of their ambitious operating-margin goal: nine per cent, up from about 6.4 in 2017. The company, which reported record first-quarter 2018 earnings of $56 million on revenue of $964 million, was founded in 2001 and made acquisitions a key driver. 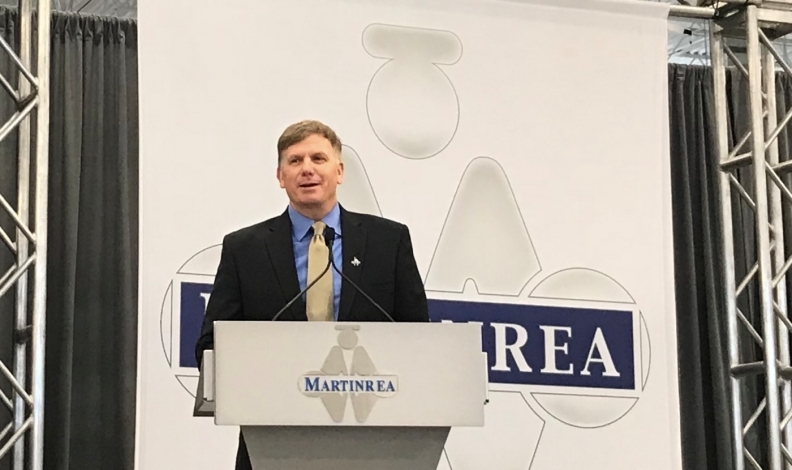 But over the past two years, Martinrea has focused on natural growth through cost reductions, inventory control through flexible manufacturing and more centralized leadership. CEO Pat D’Eramo, a former vice-president of manufacturing at Toyota Motor Manufacturing in the United States, said that approach has paid off for Martinrea in its earnings and its share prices, which in May were trading at levels not seen since 2007. The shares closed at $13.55 Friday in Toronto. Still, D’Eramo said the Martinrea's transformation into a more “lean” manufacturer is ongoing. At the same time, the company’s top brass has been more hands-on with plant operations. D’Eramo said those changes have not been without challenges. About one-quarter of the company’s leadership at its various plants in North America have left Martinrea in the past few years. “The hardest part was getting people on board with the operational piece,” he said. “We had been very decentralized. I always tell the story. I’ll never forget my second day on the job when I was talking with someone from one of the [automakers], and he said, ‘Which Martinrea are you from?’ Because we were so dispersed. D’Eramo said Martinrea has new business lined up with BMW, Daimler and Toyota. Combined with the launches of the high-volume Chevrolet Silverado and Ram pickup — for which the company supplies components — that will help Martinrea achieve the nine-per-cent margin goal. “Getting into a wider customer base is big for us, and it’ll help us as we move forward,” D’Eramo said. That focus on new business and on operational improvements means Martinrea can be more discerning when it comes to acquisitions, company CFO Fred Di Tosto said. D’ERAMO: “It’s great for us. The complexity of parts increases. The lightweighting needs are greater. It just advances where we want to go faster. “We think that hybrids are going to be the big winner in this. With autonomy and the draw of the [central processing units] and the weight of the CPUs, the current EVs are going to struggle. “I don’t believe, personally, that you’re ever going to see 100 per cent autonomous unless motorcycles are eliminated from the earth. How many guys on motorcycles or driving convertible Porsches want to be autonomous? I see a mix, always. “A lot of the data implies that the number of autonomous vehicles that are owned are going to be much greater than you would think. And the ones that are shared, there will be a tremendous amount of time and miles on them, so there will be more wear and tear on them. WILDEBOER: “We’re very close to the Canadian negotiating team and to Flavio [Volpe, president of the Automotive Parts Manufacturers’ Association]. And as we’ve gone this whole time, we’ve had experts, including NAFTA experts, border experts, tax experts and counsel, effectively working with us. So we’re in essence running a case study for people. That’s part of public service. “The key is [to] get your facts straight. I’m not sure the U.S. team has their facts straight. But it’s a negotiation, and I’m not sure they care in the context of that. They want more assembly plants in the United States. Where we sit, we can go wherever our customer does in any case. With respect to NAFTA, a lot of the really bad proposals are behind us. There’s a recognition that there’s a lot of good here. WILDEBOER: “A company will make a decision based on all-in costs and then the certainty of the environment that they invest in. And there, I think Ontario and the feds have put on a number of things that have been death by a million cuts: energy policy, taxes. Some of our traditional advantages like the low Canadian dollar and lower health care costs and lower taxes are going away because the U.S. has lowered taxes. “The thing with Toyota is, would they have required as much as they got from the Ontario and Canadian governments if these other things were more competitive? It seems a little strange that you have to write a cheque, though it makes sense. You have to write a cheque to make yourself competitive and level the playing field.